The Vendée is an attractive region of the Atlantic Coast. It can be visited in any season, for a great holiday. The Vendée is the ideal place for a relaxing holiday, thanks to the wonderful fine sand beaches and as much sun hours as in Basque Country. You’ll never be bored during your holiday in the Vendée! : water sports activities, hiking, cycling and horse riding as well as monuments can be found all over the region. Attractive towns: Brem sur Mer, Les Sables d’Olonne, La Tranche sur Mer, Saint Jean de Monts, you can visit these seafront towns located a few kilometres from the campsite, filled with entertainment, concerts and cultural activities in high season. Also visit the capital of the Vendée with many cultural visits: La Roche sur Yon. Great landscapes to discover: the Vendée boasts a number of small islands, reachable by ferry or bridge. 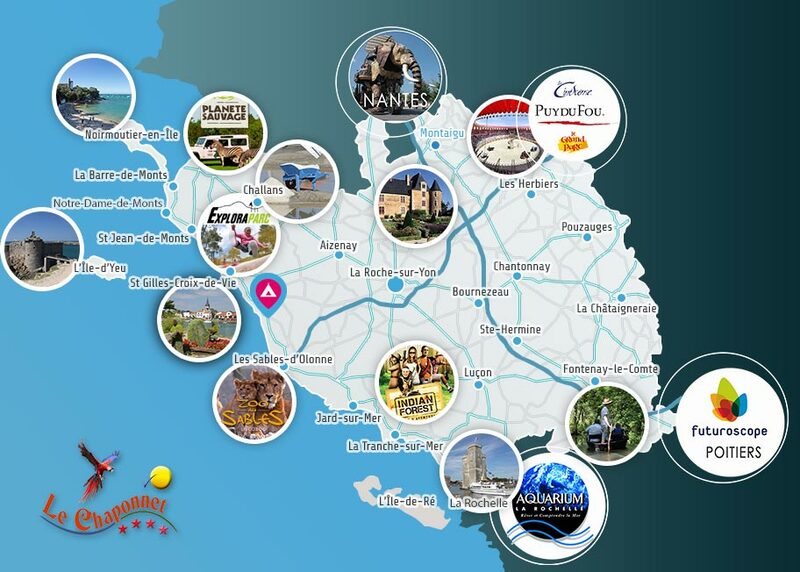 Exploring these islands is truly an exceptional activity during your stay in the Vendée. A very savoury gastronomy! : taste the various seafood or the famous ham of Vendée with beans! Camping Le Chaponnet welcomes you in the Vendée in all seasons, for a pleasant stay filled with relaxation, activities, farniente and sports. Prepare your holiday programme and discover this region scattered with history and culture. The Vendée is also a region full of history, with the famous wars of the Vendée. Visiting the Historial and Memorial of the Vendée will allow you to learn all about this period and discover the life of the Vendée people until our days. For a family visit, the children’s museum offers a great exhibition themed on farm animals. So, whether you bring your family or friends: enjoy your stay in the Vendée!